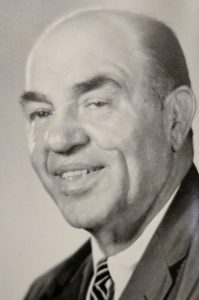 Henderson Tourist Commission – Do You Know This Kentucky Sports Legend? Henderson Tourist Commission / history / Do You Know This Kentucky Sports Legend? Get ready to meet one of the most interesting people to ever live in Henderson, Kentucky. 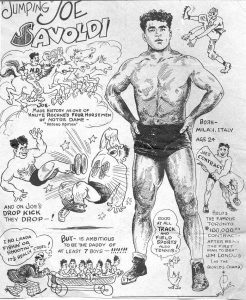 Joe Savoldi (1908-1974) was born in Italy, but became an icon in American sports (and probably would have been a heartthrob to thousands of teenage girls, had televisions been wide-spread in the 1930s). 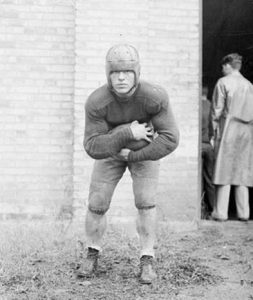 Joe played football for Notre Dame beginning in 1928, and was later signed by NFL Green Bay Packers coach Curly Lambeau, but ended up signing and playing for the Chicago Bears. As if these two teams needed another reason to have a rivalry… Packers-0, Bears-1. The nickname “Jumping Joe” stuck after he jumped (more like dove) over the goal line after scoring a winning touchdown against Carnegie Tech in 1929. Considering football helmets were only made of leather and players wore no shoulder pads, this stunt was actually considered very dangerous during this era. At the age of 23, Jumping Joe signed two contracts. 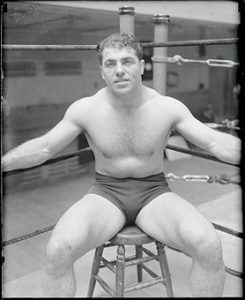 Joe signed a professional wrestling contract in May 1931. In October of the same year he signed a motion picture contract with Hollywood. We’re not aware if he actually appeared in any films, but word on the street is he was considered for the role of Tarzan. 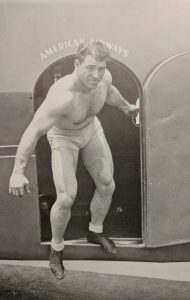 At 5 foot 11 inches and 218 pounds, Jumping Joe was awarded the controversial title of Heavyweight Wrestling Champion of the World, although the title was not universally recognized. 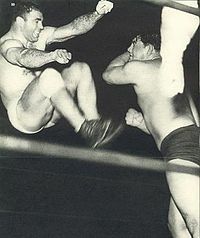 Jumping Joe’s signature wrestling move was none other than the flying dropkick… how fitting! Joe also dappled in entrepreneurship by introducing an energy drink to the market. 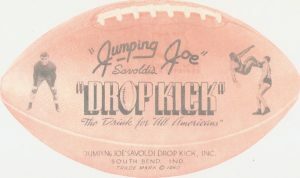 The beverage was called “Jumping Joe Savoldi’s Drop Kick, The Drink For All Americans,” – Pour us a glass please! The drink had already landed a contract with Notre Dame, but because it was introduced in 1941, the United States was rationing sugar due to the World War II conflict. Unfortunately, this prevented the drink from being mass-produced. 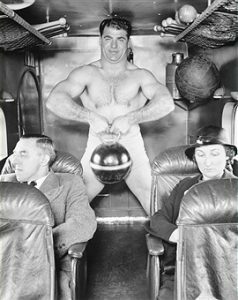 Because of Joe’s fluency in Italian, familiarity with Itlay’s geography, and amazing Tarzan-like strength and combat experience, Jumping Joe was approached by Uncle Sam to join the war effort as a spy in the Office of Strategic Services (aka the top-secret agency that preceded the CIA). This American hero became an undercover agent with the code name “Sampson.” Joe parachuted behind enemy lines and extracted secret documents throughout 1943-1945. 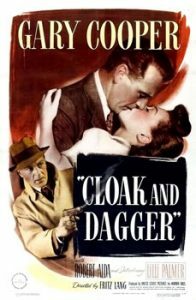 His war efforts were documented in the book Cloak and Dagger under the chapter title, “The Saga of Jumping Joe.” The book later became adapted into a film. Looks like Joe made an impact on Hollywood after all! 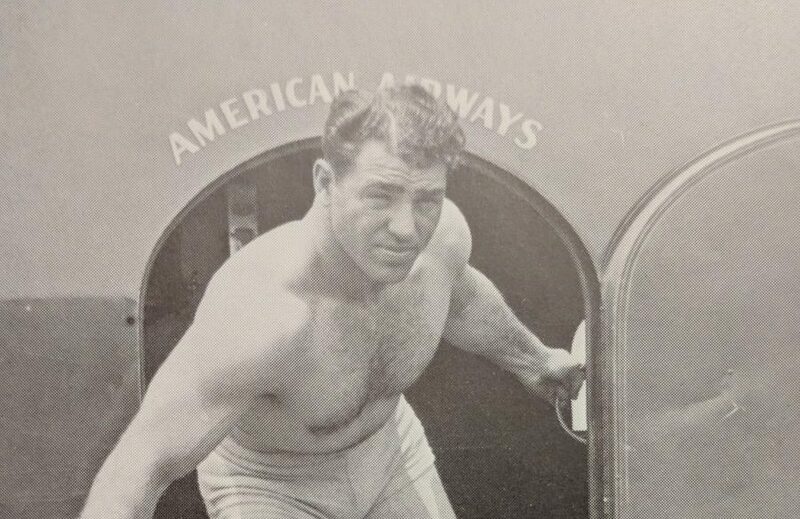 Joe returned to his professional wrestling career before World War II ended. Jumping Joe was a household name to many, and he was enormously popular in New Zealand, Australia, South Africa, France, and across Europe, and both North and South America. Though Joe began developing arthritis, he still performed in the ring and is even credited with training (and nicknaming) the first African-America wrestler, Houston Harris, aka Bobo Brazil. Add professional wrestler trainer to the already impressive résumé. 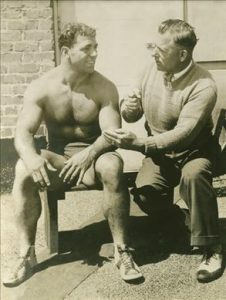 After Joe’s last wrestling match in 1950, he went back to the university to get his teaching degree so that he could mentor hard-to-reach kids. Joe Savoldi became a full-time science teacher at Henderson County High School with over a decade of service in the teaching profession. Much loved by his students, the class of 1973 dedicated a page in their yearbook to his many accomplishments. We were so impressed with Jumping Joe’s story that we decided to design a one-of-a-kind, vintage inspired tribute tee for this American icon and Henderson native. 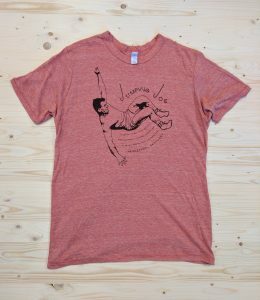 Grab your Jumping Joe tee in our online gift shop — makes a perfect gift for its namesake’s former students, history buffs, or just plain buff guys (and gals). Click here to check out our online gift shop.